The bill was introduced on 5th December 2013, the first day of the winter session in AP assembly. The Union cabinet approved the Telangana with ten districts. Hyderabad will remain as the common capital under the Governor’s supervision for not more than ten years. 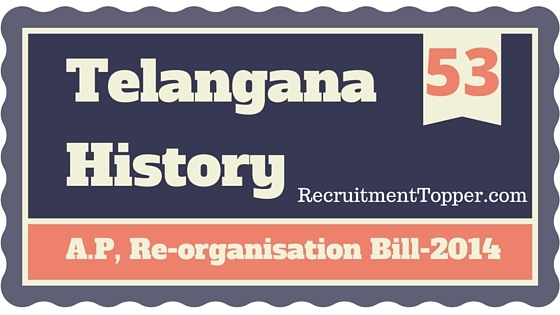 The Bill was drafted based on the boundaries of the proposed Telangana State as approved by the Union Cabinet in its meeting on 3 October, 2013. The new state of Telangana would have 119 elected MLAs, 40 MLCs, 17 MPs of Lok Sabha and 7 MPs of Rajya Sabha. The residuary state of Andhra Pradesh would have 175 elected MLAs, 50 MLCs, 25 MPs of Lok Sabha and 11 MPs of Rajya Sabha. There would be a common High Court and its expenditure would be apportioned between the two successor states based on population ratio until a separate High Court is set up under Article 214 for the residuary state of Andhra Pradesh. The existing Public Service Commission would be the Public Service Commission for the residuary state of Andhra Pradesh and the Union Public Service Commission would, with the approval of President, act as the Public Service Commission for Telangana. Meanwhile, the new born state of Telangana appointed its own state public service commission (TSPSC) with Ghanta Chakrapani as its head. The ministry of water resources of the Government of India would constitute a Krishna River Management Board and a Godavari River Management Board within a period of 60 days from the date of coming into force of the Andhra Pradesh Re-organisation Bill. The Boards would be responsible for the administration, regulation and maintenance of the head works of the dams, reservoirs or head works of canals, as notified by the Government of India on Krishna and Godavari rivers, to implement all the awards made by the Tribunals. The Boards would be responsible for making an appraisal of proposals for construction of new projects on Krishna and Godavari rivers and give technical clearance. The Governor shall have special responsibility to the security of life, liberty and property of all those who reside in the common capital of Hyderabad. The Governor’s responsibility shall extend to matters such as law and order, internal security and safety of all vital installations in the discharge of these functions. This transitory provi¬sion shall cease to have effect after a period not exceeding 10 years. The Bill provides for the creation of separate cadres of All India Services in respect of the two states from the appointed day. Advisory Committee(s) would be constituted to ensure fair and equitable treatment of all employees. The Government of India shall help the successor states of Telangana and Andhra Pradesh in raising additional police forces for maintenance of public order and shall also deploy one additional unit of the force in Hyderabad for a period of five years. The Greyhound training centre in Hyderabad shall function as common training centre for the successor states for three years. In this period of three years, the Gol shall assist the successor state of Andhra Pradesh in setting up a similar training centre for Greyhounds. The existing Greyhound and OCTOPUS forces shall be distributed between the two states. Of the total equity of Singareni Collieries Company Limited (SCCL), 51 per cent shall be with Government of Telangana and 49 per cent with Government of India. Existing coal linkages of SCCL shall continue without any change. New linkages shall be allotted to the successor States as per the new coal distribution policy by the Government of India. Allocation of natural gas will continue to be done as per the policies and guidelines issued by the Government of India. The royalties payable on domestic on-shore production of oil and gas shall accrue to the state in which such production takes place. Allocation of power from Central generating stations shall be allocated to the successor states in the ratio of the average of the actual energy consumption of last five years of the relevant Discoms. For a period of 10 years, the successor state that has a deficit of electricity shall have the first right of refusal for the purchase of surplus power from the other state. Later Polavaram ordinance merging the project-affected villages in the residuary Andhra Pradesh state was accepted by the Parliament in July, 2014.